The colors for this challenge are Navy and Coral. I was trying to search for a little visual inspiration when I ran across a card of a man's striped dress shirt. I then decided to use this wonderful digi designed by Yolanda Derstine http://yolanda-imaginemakeshare.blogspot.com and print it out on the striped paper. I fussy cut the image and and very lightly inked the edges to cover up the white edges then popped it out with foam. Added coral jute and stamped the sentiment from CTMH. 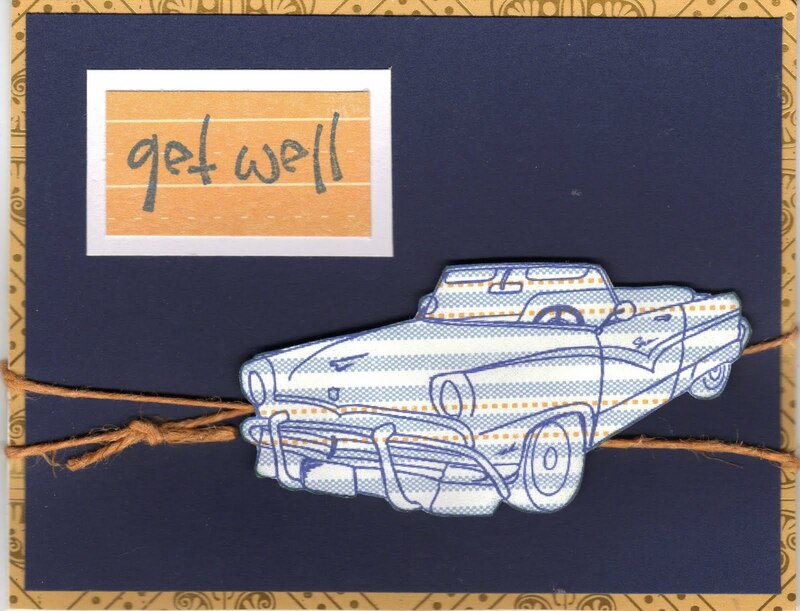 Tonight is a fundraiser for a friend who had a motorcycle accident and I need a get well card. Wah-la, it's done! So so cool!!!! Thanks for playing at OTWC!! What a fabulous masculine card!!! Thanks for playing along with OTWC! Linda! This is the PERFECT man card! I always dread them! :-) Love the car! Thanks for joining in the fun at OTWC and Good Luck!